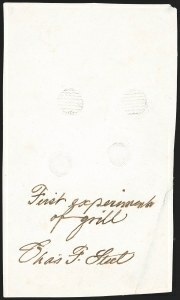 AN OUTSTANDING AND RARE ESSAY SHOWING THE FIRST EXPERIMENT OF THE GRILLING DEVICE INVENTED BY CHARLES F. STEEL AND SIGNED BY HIM. ONE OF THE MOST IMPORTANT GRILLED ISSUE ITEMS IN EXISTENCE. 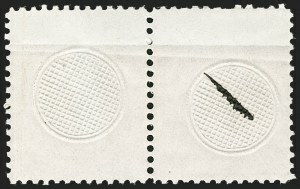 On October 22, 1867, Patent No. 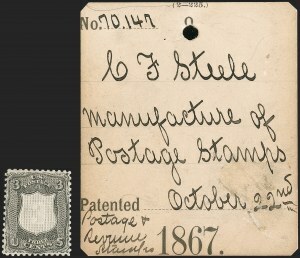 70,147 was issued to Charles F. Steel for a device specifically designed for applying a grill to postage stamps (see lot 224 for the patent card). 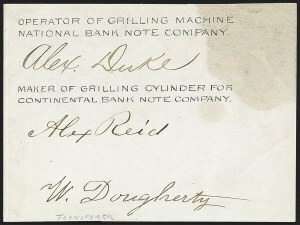 As noted in our introduction to the grilled issues in the Siegel Encyclopedia, available at http://siegelauctions.com/enc/pdf/1867.pdf , correspondence is known from Steel as early as 1865 demonstrating his efforts to persuade officials to employ his invention. 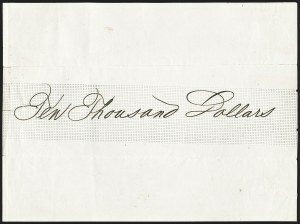 This essay, likely produced in 1865, is of great historical importance. We are aware of only three examples of this rare essay. 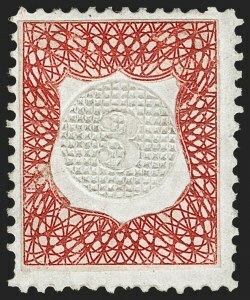 One of the others, ex Finkelburg, has the positions of the top and bottom grills reversed. VERY FINE. 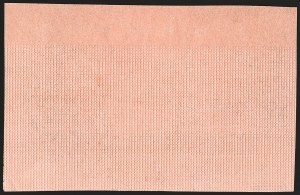 THIS COMPLETE SET REPRESENTS THE ONLY RECORDED EXAMPLES OF THESE EARLY ODD-SHAPED COLORLESS GRILL ESSAYS. A SPECTACULAR SET FOR EXHIBITION. The first four odd-shaped grills offered in this set also show grilling in the larger square background. 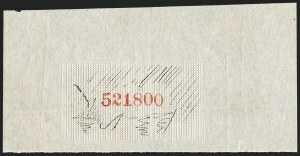 This might indicate the use of two different grilling devices in their production, but Brookman notes in his United States Postage Stamps of the 19th Century that the grill points on each stamp are in perfect alignment -- indicating that the backgrounds were polished to allow the central design to stand out more clearly. Therefore, it is surmised that they were produced by the same grilling device. Ex Brazer and Finkelburg. Illustrated in Brookman on p. 77 and in Scott Catalogue on p. 846. 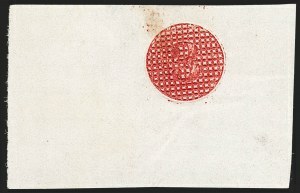 Charles F. Steel, 3c Carmine, Colored Grill with Points Down on Quadrille Batonne Watermarked Paper (79-E13d). 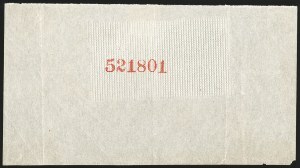 43 x 27mm, deep rich color, small thin spot at top, appears Very Fine, very rare, the only other example we have encountered (ex Finkelburg and "Lake Shore") has a second partial grill below the main grill, Scott lists this essay that way, probably because the editors were not aware of this example which lacks the second partial grill, ex Thomas Morris Sr.